Health - VeterinaryPartner.com - a VIN company! Useful information for keeping your pet happy and healthy. 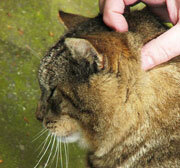 Get tips and suggestions on caring for your feline family member! No matter what kind of pet you have, if there are teeth present, you can bet they require some care. What can you do to help keep your pet healthy? Can you recognize an emergency? Are you prepared? Tips to keep your pet clean, comfortable and beautiful. Tips on raising a happy, healthy kitten. What you should know about pet foods. New puppy? Find out how to help your puppy grow into a great dog. Pets are living longer - find out how to help them enjoy a happy, healthy old age. Dr. Brown has a significant background small mammal medicine. Most important is love, but pets do require a few other things to be well cared-for! Most pet owners know that vaccination is part of basic pet care but it may be surprising to see how much there is to know. There are different types of vaccines, new technologies, and even risk factors. We invite you to explore this area for the latest information.